The Blog Feed content type allows you to pull in content from your blog into your website. This content type utilizes blocks, so you must first create a block before you add it to the page. Email cmshelp@brandeis.edu, and request that an RSS Block be set up on your site. Include the link to the RSS feed or blog in your email. Find the page you want to add the Blog Feed to and click Edit. You can add your blog feed to the Sidebar (as a RSS Feed) and Content Below Main (as a Blog Feed) sections. Check the box next to Override Site Setup. (If you have other sidebar content on the page, use the plus sign ( + ) to add an additional Sidebar Group. In the Sidebar Editor, select the RSS Feed Radio Button under to Sidebar Type. Enter a Heading (e.g., Department Blog). Click the box under RSS Feed Block to open the Chooser Panel. From there you can browse to the Feed Block created by Digital Communications (located in the _blocks folder of your site). Enter a number in the Max News to Display box. This is the number of blog post titles that will appear in the Sidebar. Note: We recommend you enter a value between 3 and 5 in the Max News to Display box. If you want to add a link to your blog, select the external radio button and enter your blog URL. Check the box next to Add Content Below Main. 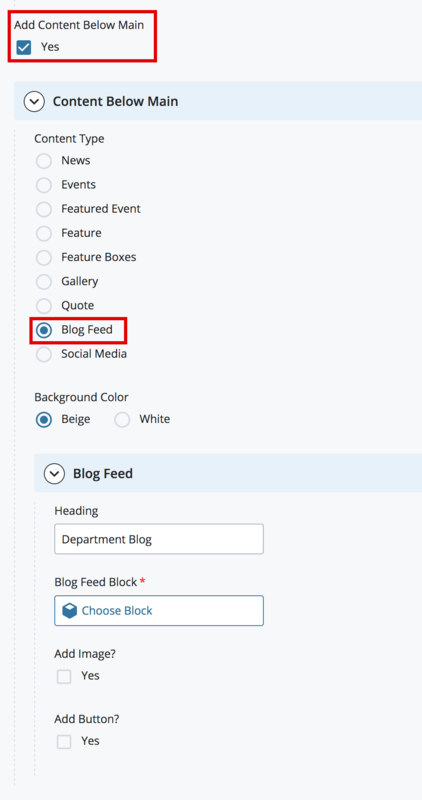 In the Content Below Main editor, select the Blog Feed radio button. For Background Color, leave as beige unless you have multiple Content Below Main modules (in which case you would want to alternate colors for contrast). Click the box under Blog Feed Block to open the Chooser Panel. From there you can browse to the Feed Block created by Digital Communications (located in the _blocks folder of your site). If you want to add an image, check the checkbox, and browse or search for an image you have uploaded to your site (735 px x 490 px). Note: The RSS Feed Block does not pull in images from the blog feed itself. The image you upload will remain static until you upload a different image. If you want to add a button to your blog, check the checkbox and enter an external link to your blog URL.